For the French Olympic bobsledder, see Pierre Bouvier (bobsleigh). 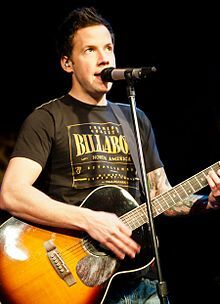 Pierre Charles Bouvier MSC (born 9 May 1979) is a Canadian singer, songwriter, musician, composer and actor who is best known as the lead vocalist of the rock band Simple Plan. Bouvier was born to Réal and Louise Bouvier. He has two older brothers, Jay and Jonathan. He attended Collège Beaubois in Pierrefonds, Quebec, with bandmates Chuck Comeau, Jeff Stinco, and Sébastien Lefebvre. Before and partly during his early musical career, Bouvier worked as a cook at St-Hubert in Montréal. Bouvier has two daughters, and has been married to Lachelle Farrar since 2013. When Bouvier was 13 or 14 years old, he founded the punk rock band Reset with his best friend Chuck Comeau in which he was the bass guitarist and lead vocalist. He was not happy with Reset and left the band in 1999, a year after Comeau's departure in 1998. His current bandmate David Desrosiers took his place as lead vocalist and bass guitarist. 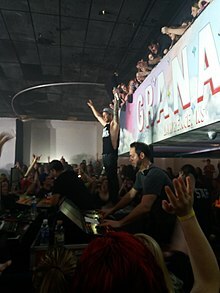 He later met Comeau at a Sugar Ray concert and joined him in creating Simple Plan with old schoolmates David Desrosiers, Jeff Stinco and Sébastien Lefebvre. He hosted the MTV reality show Damage Control. Pierre is best known for owning a collection of Takamine acoustic guitars which he uses in every album and while playing live. He also owns a few of Fender electric guitars. ^ "Pierre Bouvier Biography". IMDB. ^ "Damage Control | Full Episodes, Photos, Episode Synopsis and Recaps". MTV. Retrieved 17 September 2012. ^ "Pierre | Damage Control". MTV. Retrieved 17 September 2012. This page is based on the Wikipedia article Pierre Bouvier; it is used under the Creative Commons Attribution-ShareAlike 3.0 Unported License (CC-BY-SA). You may redistribute it, verbatim or modified, providing that you comply with the terms of the CC-BY-SA.